I am a beer girl, through and through. I love wine, too – red or white, it doesn’t really matter, as long as it’s on the dry side – and I’m not one to scoff at a bubbly vodka-soda. But some occasions call for cold, fizzy, thirst-quenching beer and anything short of it will throw you (me) into a dizzying, downward spiral of disappointment. Because red wine isn’t chilled, white wine isn’t carbonated and mixed drinks disappear after three sips. I’ve tried tricking myself, downing a chilled can of club soda instead of a beer when I enter our non-air-conditioned apartment after a sticky summer walk from the subway station. But my brain’s not fooled: it misses the buzz. So, but lately, beer and I have been on the outs because it’s been hurting my stomach, twisting my guts into tight, excruciating tangles (see Fireman’s Chair Knot) that strangle any potential for pleasure. 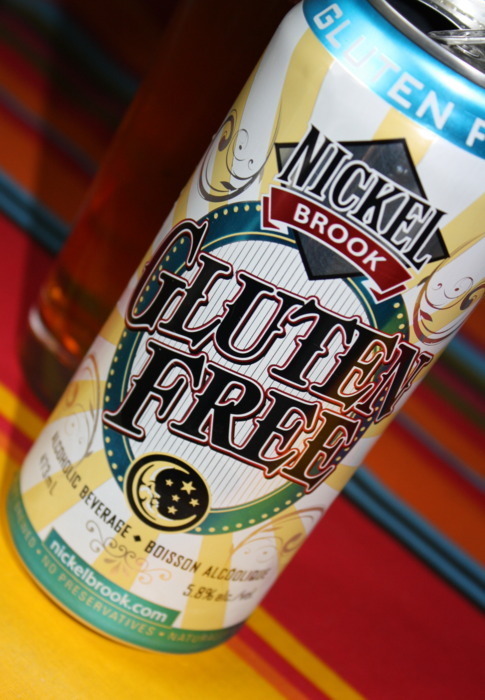 Imagine my delight, then, when I saw Nickel Brook’s Gluten Free alcoholic beverage that “any beer lover will enjoy” – beer lovers who, like me, aren’t quite down with drinking a pint of gluten. In an effort to rekindle my affair with beer, I gave it a whirl. Made from sorghum, Nickel Brook Gluten-Free is sweeter than beer and less carbonated, although you do get a thin layer of head – like cirrostratus clouds against a tawny sky – on the first pour into a glass. It’s refreshing. The packaging is cute. The price is right. And my guts are still happy after downing an entire can. All in all, I give it an 8 out of 10 and just might make it my new hot-weather go-to.